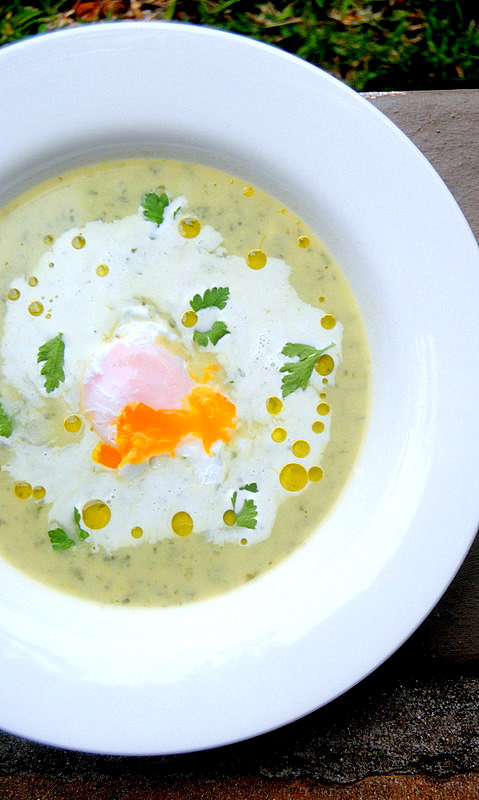 Liquid-centred 'poached' eggs add a touch of drama to this clean-flavoured watercress soup. This isn't a complicated recipe, but it does require some attention to detail. The trick is to get the eggs just right, because most of the fun in eating it comes from puncturing the egg with your spoon and swirling the golden yolk around the bowl. I am a great fan of watercress, and think it's a most under-appreciated ingredient. Rocket is partially to blame for this, because this ubiquitous leaf, with its delicious, peppery twanginess, has a habit of hogging all the limelight, especially in salads. Watercress - now abundant on local supermarket shelves - is often considered a second choice to rocket, and I can't understand why. Watercress has a fresh bite and a lovely clean metallic taste, and is as good raw as it is lightly cooked. This is a good light soup to serve, sequinned with olive oil and generously doused in cream, to friends on a cool spring evening (and there seem too many of those in Cape Town these days). However, since neither the most experienced cook nor the most foolhardy one should consider dangling over a hot stove poaching eggs the old-fashioned way when there are guests to greet and wine to quaff, I recommend that you use a clever restaurant trick: partially cook the eggs in clingfilm ‘purses’ well ahead of time and then quickly reheat them minutes before serving. Rinse the watercress, pick off the leaves and set them and the stalks to one side. Heat the chicken stock in a large pot, add the watercress stalks and potato slices and cook at a brisk simmer for 15-20 minutes, or until the potato is very tender. Melt the butter in a separate large pot, add the leeks, cover the vegetables with a circle of baking paper (or the wrapper from a block of butter) and cook over a low heat for 7-9 minutes, or until very soft. Remove the paper, stir in the flour and cook for another minute. Turn up the heat slightly, add the reserved watercress leaves and cook, stirring, for 3-4 minutes, or until the leaves have wilted but are still a fresh green colour. Now add the hot stock and potatoes, stir well, bring to a gentle boil and simmer for 3 minutes. Squeeze in the lemon juice, then blend to a smooth purée (but not too fine; the soup should be flecked with green). Reheat the soup, mix in the cream and season to taste with salt and pepper. Make the eggs in advance. Line a teacup with a large square of clingfilm and generously brush the inner surface with sunflower oil. Break an egg into the cup, bring up the edges of the plastic, twist them together to make a ‘purse’ and then tie into a knot, as if you are knotting a balloon. Make sure there is not too much air between the egg and the knot. Repeat with the remaining 7 eggs. Fill a big bowl with iced water and 10 ice cubes. Bring a pan of water to a very gentle rolling boil, add 4 of the egg purses and poach for exactly 3 minutes. Plunge the purses into the iced water and chill for 5 minutes. Cut through the knots with scissors, gently peel away the plastic and place the eggs on a plate. Repeat with the remaining eggs. Cover the plate with clingfilm. When you’re ready to serve the soup, slip the eggs back into a pan of gently boiling water and reheat for exactly 1 minute (set your oven timer to remind you!). Fish the eggs from the water with a slotted spoon and drain quickly on kitchen paper. Ladle the hot soup into bowls and top each one with a puddle of cream, a poached egg, dots of of olive oil and a few leaves of watercress or flat-leaf parsley. This soup can be made up to 4 hours in advance, but no longer, or it may lose its colour. Poach the eggs up to 4 hours ahead, and keep them in the fridge. It’s a good idea to poach a few extra eggs, just in case the yolks break or the whites refuse to come away from the plastic. Practise poaching an egg the day before if you’re not feeling confident. Try this soup with other tender fresh leaves, such as sorrel, rocket or baby spinach. Saw this title on Twitter yesterday and was already smitten :) You are so right that poached egs have to be done just so - a few seconds too long and all is lost! I love the clingfiln pouches trick too... Beautiful shot!